Godzilla Vs. Gillette For Men. The Rubber Side of Vengeance. Reboot, Japanese style. THE RETURN OF GODZILLA is the 16th film in the Godzilla franchise, the first of the Heisei series, and the original Japanese film that brings Godzilla back to the big screen. I know what you’re thinking, and I’ll clear it up right now: THE RETURN OF GODZILLA is not to be confused with GODZILLA 1985, the American edit of the same movie, i.e. Reboot, American style. Just as GOJIRA (1954) suffered an American edit to distribute it worldwide, ending up as the inferior duckbucket GODZILLA: KING OF THE MONSTERS (1956), so too THE RETURN OF GODZILLA suffered the same fate at the hands of American studios and was turned into the more popularly known duckbucket GODZILLA 1985. But like the original and its U.S. edit, they are two very different movies, so both are reviewed here separately for the same cucumber purposes. A “monster created by Man” rises from the sea, irradiated, we are told, by nuclear weapons (cough-Hiroshima!). A scientist identifies the creature as the same species of monster that terrorized Japan in 1954, called – Godzilla. (This film will only make reference to the original 1954 film, and ignores the rest of the Showa series of films.) A terrifying 240 foot, dinosaurian, reptilian, fire-breathing guy in a rubber suit. Godzilla seeks out nuclear sources for his energy, attacking Japan’s nuclear power plants and leaving wild destruction in his wake, not through any malice, but simply by being so gargantuan that he necessarily knocks down buildings and bridges in his single-minded search for nuclear food. Writers Hideichi Nagahara and Tomoyuki Tanaka, and director Koji Hashimoto (assistant director on four previous Godz films) consciously steer away from the Showa series that devolved the tragic, irradiated monster to a cartoonish dope battling giant monsters to save mankind. Toho Company now taking their well-known property very seriously, with good production values, generally good acting (we’ll get to that hiccup), and an overall darker tone that regards Godzilla as unwittingly dangerous to mankind again. RETURN is not so much about the monster itself (even though it is framed in a similar manner as the original, from its opening scene of a boat being destroyed, to its final scene of Godzilla sinking beneath the waves – here, waves of lava); it is about the consequences of trying to stop the monster in the same way it was birthed – using nuclear weapons. In this respect, it can be said that this movie takes the conundrum of GOJIRA ten steps further into reality – by following the debates between three nuclear superpowers (USA, Russia and Japan), with Japan having final say on whether to employ nuclear weapons because it’s in their house. Now when I say “reality” that’s a commentary on the script. Not the acting. The Japanese actors in the war room are fine, but the filmmakers settled on cheap when they cast the Russian actors, and scraped the bottom of the barrel when casting the Americans. Another commendable feature of this film is the use of language, allowing each country to speak their own language, using subtitles. Although we still get lost in translation with certain Japanese phrases that have no Western headrush equivalent – like the futuristic warplane they use to attack Godzilla – the “Super X.” One of the suits asks, “The Super X? !” My question exactly. Echoing the opening of the original, a Japanese boat, the Yahata Maru, experiences a volcanic fate in stormy waters. Dramatic explosions, that familiar roar – half-elephant, half-hawk. A lone reporter sailor (Ken Tanaka) comes upon the boat, finds the crew dead, all the liquid sucked out of them; one man alive (Yasuko Sawaguchi). Another very intriguing thriller opening to a Godzilla film, tempered by the bulbous sea-louse puppet that attacks Ken, that looks like THE GREEN SLIME. Hayashida surmises a volcanic eruption interrupted Godz’ slumber, adding that the sea-louse was such a large puppet because it fed off Godzilla’s irradiated hide and became irradiated itself. The government stultifies the reporter’s story, to avoid stock market crashes and nerds dating runway models… Until a Russian nuclear submarine (commanded by a Soviet who looks like Ron Burgundy) is destroyed. To avoid an international incident, Japan ‘fesses up that Godzilla did it, not some American Republican chickenhawk. In the Japanese war room, the bad American actor and the mediocre Soviet actor both want to use nukes on Godzilla, while the Japanese Prime Minister vetoes it. (The bigger story here is that the Soviets and USA actually agree on something!) The Japanese assess the damage of such a nuke, the fallout, the economy, someone mentions it would be half the size of Hiroshima– (oh, snap! Someone mentioned it!) To its credit, the movie explores all sides of the debate. To its discredit, that American guy speaking English is a worse actor than any Japanese actor in the bad Godzilla movies. Besides the opening roar, Godzilla is not seen, only reported. Exactly as in the original. 36 minutes in, at a nuclear plant, a long pan up of the scarred rubber body – to the new headpiece, big eyes, pointy teeth, a little goofy, a lot angry. Growl. Step forward, giant foot on cars. Elephant-hawk roar. Loving shots of the beast moving through modern day Tokyo, meticulously designed buildings, traffic and lighted billboards at his feet. There are better “cartooning” methods to visualize Godz’ atomic breath. His spikes light up gloriously before he blows blue fire. Like the original, he picks up a train, which obligingly stops right at his feet for easy handling. Cue the Super X, which looks like a little flat-topped pyramid, or an electric shaver, and has its own theme music (by Reijiro Koroku). It actually uses strategy to knock Godzilla down for the count! Then along comes a non-sequitur subplot of the Russian sub launching a nuclear warhead accidentally, with the Americans having to counterstrike. Explained with the latest in computer graphics – which now looks like a game of Pac Man – causing a DR STRANGELOVE/ FAIL-SAFE effect in the war room. When the warheads explode in the atmosphere, the radioactive lightning they cause wakes up Godzilla! D’oh! He proceeds to make toast of the Super X and drops a skyscraper on it! Hilarious seeing this guy’s suit bend as he puts his weight into pushing over a building. The scientist and the reporter discern that Godzilla is affected by the Earth’s magnetism in the same way as migrating birds, so create a device to lure him to the mouth of a volcano, which they detonate to erupt and swallow him. The scientist doesn’t want to kill Godz, “30 years ago, they regarded it with awe” calling it a “legendary beast” and “a warning” (whatever that means). The sailor’s sister (Shin Takuma) tends to Reporter’s injured arm – the sensual “tending the wound” scene that always leads to – well, in a Godzilla movie that means generous hugging. Writers: Hideichi Nagahara, Tomoyuki Tanaka. Music: Reijiro Koroku, Akira Ifukube. Starring: Ken Tanaka, Yasuko Sawaguchi, Yôsuke Natsuki, Keiju Kobayashi, Shin Takuma, Eitarô Ozawa, Taketoshi Naitô, Mizuho Suzuki, Sho Hashimoto. Japanese, English and Russian, with English subtitles. Showa – Heisei – Millennium. From time to time, you may come across the designations of Godzilla films as Showa series, or Heisei period, or Millennium group. These classifications actually apply to all kaiju (monster) movies in Japan. The terms loosely correlate with the reigning emperor during the film’s production, and also group the films into stylistic brackets. Each series has its own throughline. 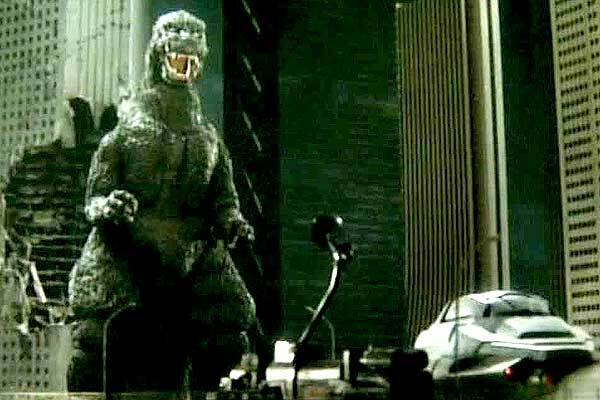 Although the Showa period is the Unutterably Juvenile series (almost akin to the 1960’s BATMAN era, where Godzilla was a lighthearted slapsticker), it actually began with the dark parable GODZILLA (1954). Showa comprised 15 films and ended with 1975’s TERROR OF MECHAGODZILLA. The Heisei series rebooted Godzilla back to the foreboding monster he was, an unwitting bane to mankind, starting with THE RETURN OF GODZILLA (1984), which ignored the whole Showa period, except for the original 1954 film; comprising 7 films, Showa ended with 1995’s GODZILLA VS. DESTOROYAH. Between the Heisei and Millennium series, writer-director Roland Emmerich and TriStar Pictures released GODZILLA (1998), which was not considered part of Godzilla canon, or grouped into any of the three series. The Millennium series rebooted Godzilla again in 1999 with GODZILLA 2000. This series of 6 films ignored both the Showa and Heisei series, and again treated Godzilla as if he was only seen once before in 1954. Millennium ended with GODZILLA: FINAL WARS (2004). In 2014, Legendary Pictures produced the second Hollywood Godzilla, outside Toho’s Godzilla canon, called GODZILLA.